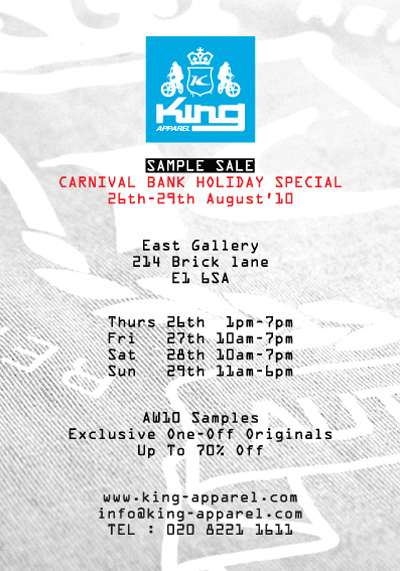 Today, Brick Lane’s East Gallery opens it’s doors as UK brand King Apparel host a sample sale, selling off samples from the current season. We had the pleasure of rifiling through these samples for the first time a good few months back, and there were some really nice pieces on display, particularly headwear and shirting, so you could well be in for a treat with items up to 70% off retail price. In addition, expect to see samples of items ranging as far back as 2005, and a decent amount of stock from the summer season gone. The sale opens today at 1pm and runs on and off until 6pm Sunday. The info you’ll need is on the flyer above and at King Apparel.